As the saying goes, “Wherever you go, Go Blue.” This couldn’t be more true for our University of Michigan fellows. 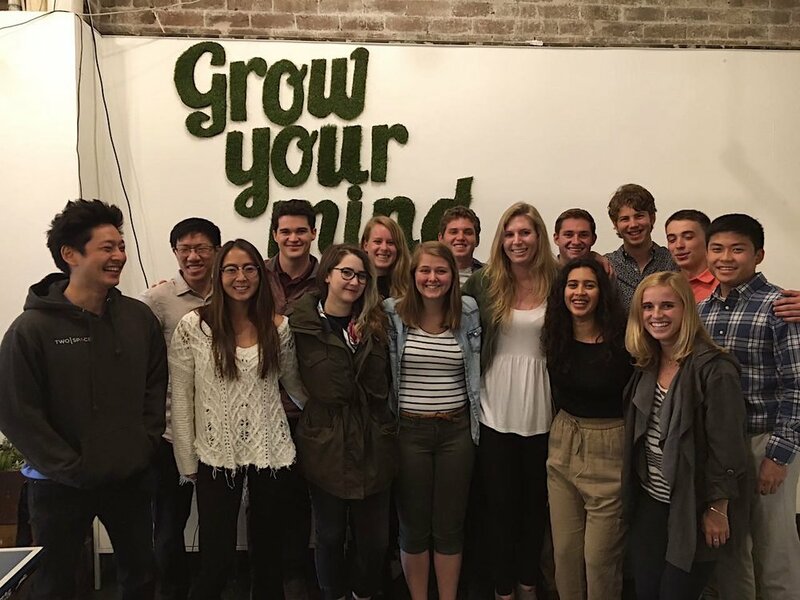 This summer alone, 18 Michigan undergraduates and recent graduates are spread across nine cities around the world (Berlin, Buenos Aires, Chicago, Dublin, Hong Kong, Melbourne, New York, Paris, and Sydney), bringing the total number of University of Michigan participants in our program to 35 since 2014. As a proud Michigan alumna myself, I can’t help but say “Go Blue” to that! We at Sage Corps HQ decided to speak with several current Michigan fellows to hear about their summers firsthand. Read on to learn about the innovative work they’ve done and the amazing experiences they’ve had! Rebecca is currently interning in Buenos Aires at Flimper, a tech startup that provides advertising and marketing services to large companies like Sprint, Verizon, and Facebook through the use of Twitter. Rebecca helps with blogs, analyzing the success of campaigns by writing cases studies, and reaching out to contacts in New York to secure new clients. She just finished her freshman year at Michigan. At this time, Rebecca plans to attend medical school or obtain a Master’s degree in Public Health or Business upon graduation. Mikey, a rising sophomore in the Ross School of Business, is currently Down Under in Sydney. He is a marketing and business strategy intern at Woveon, a software customer service company that implements AI and ML into its software to make customer service processes at companies quick and easy. His responsibilities include content marketing and attending networking events with the CTO to increase brand awareness. Name one of the biggest challenges you’ve successfully overcome this summer. When asked who his favorite Michigan instructor is, Mikey immediately responded with Sarah Zimmerman, LEO Lecturer of Business Communication and Lecturer of Executive Education at the Ross School of Business. Sarah earned her MBA with honors from the University of Toledo. She offered her insights into the power of an international internship for Mikey and his classmates. "Working abroad changed my life, so I encourage my students to consider going abroad early in their lives too. Immersive foreign internship programs allow participants to see new industry and cultural approaches in action, and programs with administrative support can allow students—and parents—to feel more at ease." Mikey would like to work at a large bank doing mergers and acquisitions upon graduation, perhaps even in Sydney. Mikey and his cohort smiling in Sydney. Jason is working in Buenos Aires as a graphic design intern at Viaedu, a company that replaces costly in-person career counseling with an online test designed to assist students in choosing a career path best suited for them. He is a rising sophomore in the Stamps School of Design. After graduating, Jason plans to first take a year to travel the world. Like Mikey, William is interning in Sydney this summer. He works at FreightExchange, an online logistics company offering interstate freight transport via road, rail, sea and air freight services and solutions across Australia. At FreightExchange, William diagnoses and fixes problems on the company website and is also developing a chatbot to help the company streamline its customer service efforts. He graduated in May 2017 with a Bachelor of Science in Information Sciences and a minor in Statistics. During William’s time at Michigan, he had one instructor in the School of Information, Colleen Van Lent, who really impacted his education. Colleen earned her Ph.D. in Computer Science and is a Lecturer IV in the School. She shared her ideas on William’s participation in Sage Corps with us. "Despite the current pressure among college students to maintain a high GPA, I always encourage my students to relax about grades and instead focus on the many experiences they can access at Michigan outside the classroom. The Sage Corps program looks like a great fit for UMSI alum. The majority of our students want to take the risks and do something outside the box. William was a student of mine in 2015 and I am not surprised to see him doing a program like this. He has that great combination of technical skills, combined with an eagerness to work as part of a diverse team on challenging problems." William plans to pursue a Master’s degree in Business Analytics. In Dublin this summer, Katie is interning at Groopeze, a software platform that makes the management and payment of group bookings easier for consumers. She is helping the company launch its new website, create content, and develop a marketing strategy. Katie is a rising junior majoring in Industrial Engineering and minoring in Entrepreneurship. Although she is unsure of her exact plans upon graduating, Katie hopes to be working in a business development or business analytics role. Katie and her cohort enjoying the scenery in Dublin. Even though all of these fellows come from the same university, it is clear that their fellowship experiences have been totally different! Living and working abroad means different things to different people, and our team loves what we do because we get to see how each student benefits from our program in his or her own way. We know that Rebecca, Mikey, Jason, Katie, William, and the 13 other Sage Corps summer 2017 Michigan fellows will find success in their future professional endeavors— and we will be here to support them every step of the way!